Eighty people from six states met at the Harriet Tubman Museum in Macon to talk about arts + community. Sometimes the most exciting and memorable speakers at the New Community Visions Initiative regional meetings are—like many magical things in the rest of life—serendipitous and unplanned. One of those inspiring moments occurred at the meeting in Macon when Reverend James Lawrence Wofford gave us words we needed to hear about equity. At all of these regional meetings, curated by Clay Lord of Americans for the Arts, designed and implemented by Michael Rohd of the Center for Performance and Civic Practice, participants—only about half from the arts—are invited to consider definitions as we talk about the role of arts in creating the future’s more healthy, equitable, and vibrant communities. In Macon, as in other places, people provided a number of responses, many of them questioning whether we have a responsibility to guarantee opportunity for all. 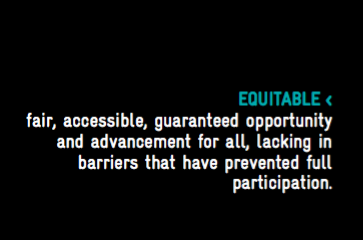 ❖ When talking about equitable, are you talking about the opportunity or the outcome? ❖ How can you guarantee ‘guaranteed opportunity’? Is it about the opportunity being there or people taking the opportunity? ❖ Can you talk about equity without talking about history? ❖ What are the costs associated with creating an equitable state? ❖ Who gets to determine what is equitable and how it is measured? ❖ What are costs of not creating an inequitable state? ❖ Is the end game about breaking down barriers or changing outcomes? ❖ Does equitable mean fair? ❖ Does advancement for everyone work if we aren't all starting at same place? ❖ What in life is guaranteed? What’s implied in these questions? They suggest that personal effort can trump systemic barriers. Some people believe that if we create the opportunity we ourselves would take, that’s enough. As if everyone’s experience in the world could be the same if they just try hard enough. But it cannot be. And it’s incumbent upon us to remind ourselves of this reality when we attempt to address community goals. If we mean to guarantee opportunity, then we have to find offers that work. Just offering without regard to outcome isn’t enough. Imagine you want everyone to have shoes. You get a whole bunch of size 9 shoes. And you post on Facebook and twitter that people can come get some shoes at a special party. But then you notice that some people walk away from your event without any new shoes. Nooooo. You know that people have different sized feet. Just offering the one-size-fits-all option you picked out isn’t likely to work for everyone. So, you don’t walk away. You have to try again. And you might want to talk to people about what they like and need before making the next offer. Reverend Wofford of Salem asked us all to walk outside the Harriet Tubman Museum to look at a monolith created to inaugurate a park in the early part of the 20th century. It’s shocking to see it. But the Reverend’s words about the engraving are the perfect reminder about privilege and responsibility. Listen to Reverend Wofford’s words. “When you see pieces of art, of history, like this, don’t get discouraged. But remember that many of you are children of privilege. Don’t get mad about that—I’m not going to get mad at you because you were born to privilege. But always remember that because you’re privileged, you have a responsibility. And part of that responsibility, the way I see it, is not to be arrogant, but always to be reminded of where some of us started at. “We didn’t start in the same position as you did. We started in a whole different position. “I’m 66 years old. I’ll be 67 on the 22nd of March. I was born in Dallas County, Alabama in 1949. I could not drink from a white water fountain. I could not go into a white restaurant and eat a hamburger. “But I’ve also lived long enough for my children to never have experienced that, and for my children to know that there has been a black man who has occupied the highest office in this nation. If you don’t think that’s change, you’ve got another thing coming. “We bring change. That’s the business of being in this work. We have to recognize that we have been blessed, and that we are fortunate, and that we have a responsibility to ensure that this kind of stuff is not perpetuated in the work we do, consciously or subconsciously. “We have to always be asking the question: who am I helping? Not only who am I helping, but why am I helping? Cross-posted on ArtsBlog by Americans for the Arts.